Alyssum seedlings can tolerate light frost, but plants are often killed by freezing temperatures. Fast growth is encouraged by mixing a balanced organic fertilizer into the soil before planting. Encourage reblooming with a liquid feed. Peas, Lettuce, Spinach, Lobelia, Heliotrope and Geranium. In white or pastel shades, alyssum in the perfect little flower to tuck into the corners of beds, or you can grow it beneath tall vegetables or among herbs. Alyssum is famous for attracting tiny wasps and other beneficial insects. 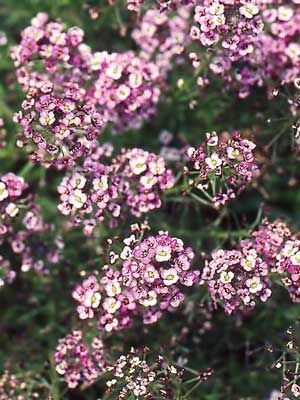 Sow alyssum from early spring to early summer, and in autumn where winters are mild. Alyssum grows fast and often stops blooming in hot weather. Broadcast seeds into cultivated soil or containers about 2 inches (5cm) apart, and barely cover them with soil. When the seedlings have more than four leaves, thin to 6 inches (15 cm) apart in all directions. Can reseed if allowed to do so, but extra seedlings are easy to lift and move or pull out. Tired alyssum plants often melt down in hot, humid conditions. As annual flowers go, they are short-lived.